Traditionally, analysts have relied on what is seen on the landscape to make decisions. In GIS, spatial analysis tactics are used to look beyond the visible range of images: multi-spectral image analysis. Data analyses bring challenges to understand ‘where’ attributes are located. It also shows how they relate to what else is found in the same locations. In spatial analysis terms, we place interest in how and why components of natural resources are located near other components. We slice near-infrared, infrared, far-infrared, humidity and temperature differentials from satellite imagery to discover what we cannot see. Satellite imagery dissection is analysed with linear and non-linear multi-attribute regression analysis. As needed, other spatial analysis tools like Kriging, variography, and geo-statistics are used to understand earth processes. Combine it all with GPS Data collection, custom map creation and printing and data are better understood, and managed. 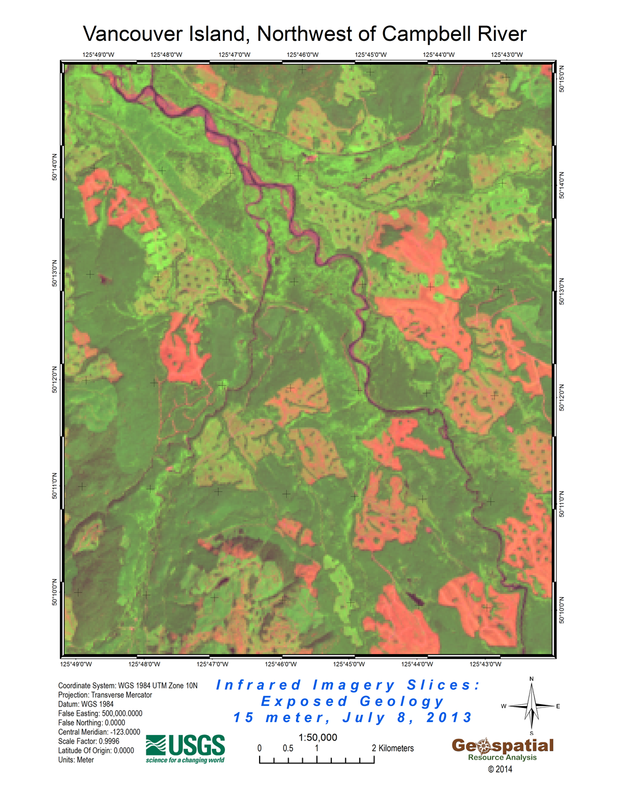 We treat GIS maps as databases of spatial analysis information. The familiar image shown in the adjoining panel shows an area northwest of Campbell River, Vancouver Island, British Columbia, Canada. This image was captured on July 8, 2013. This seemingly natural color aerial photograph is not what it seems to be. This image was captured from a satellite image collected by LANDSAT 8 OLI. This device is not a camera taking pictures of the earth. 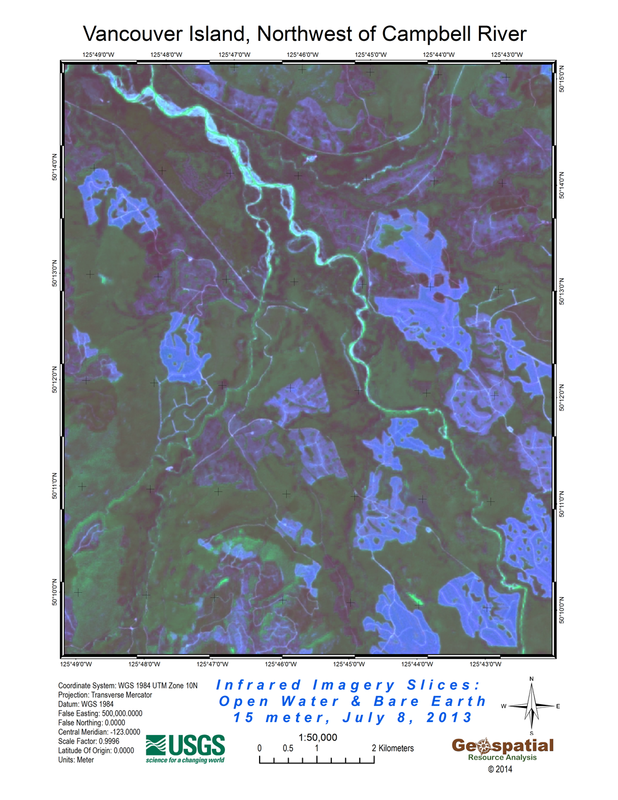 LANDSAT is a family of earth orbiting satellites capturing multi-spectral digital images. By combining certain the spectral layers together we are able to create this seemingly natural color example. It is recorded at 15-meter resolution. This is not as fine as a typical aircraft flown photograph. But this is collected on about a 4-day frequency and acquired by users at no cost. 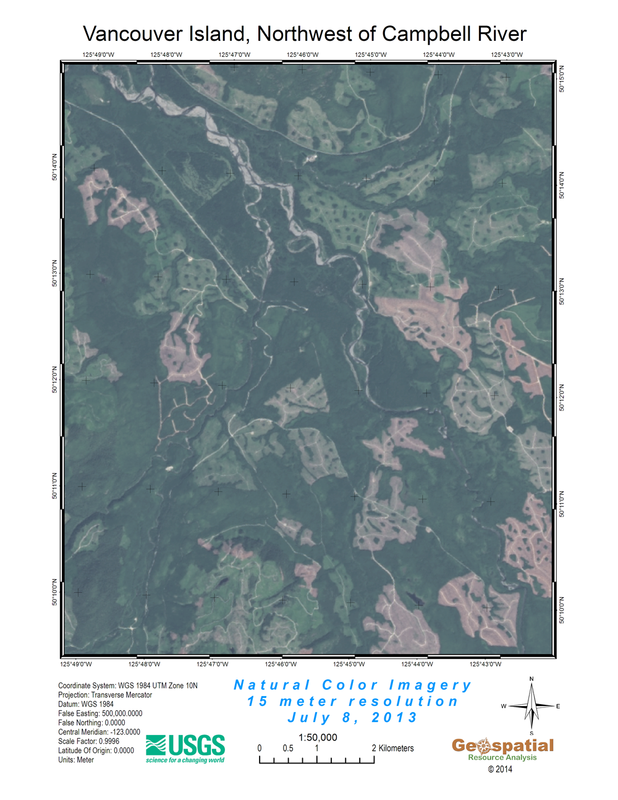 Geospatial Resource Analysis is a uniquely qualified resource when considering environmental analysis techniques. There are several analytical tools available to the spatial analyst. The tools must be fine-tuned in order to extract meaningful results that lead to improved management decisions. 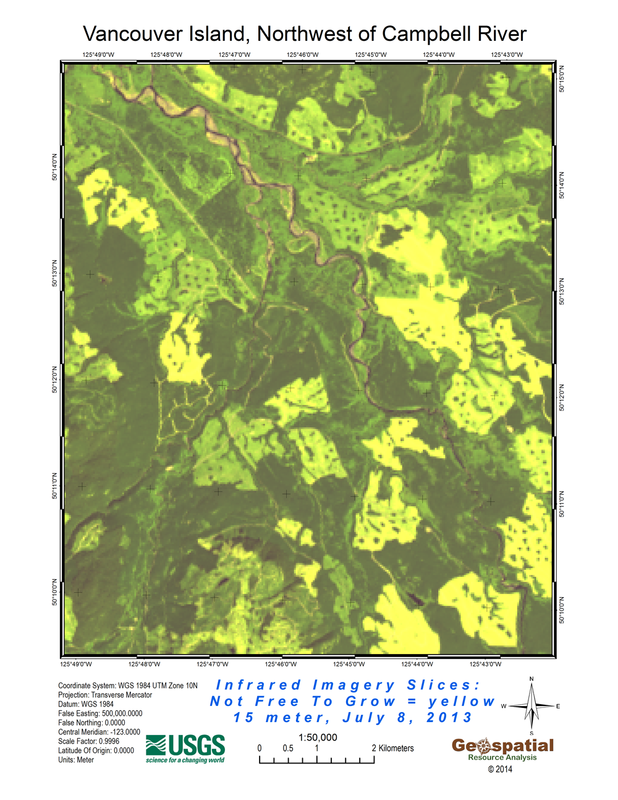 Resource mapping and “location logistics” have long been valued by forest resource managers. Technological advances in GIS systems (spatial analysis) and value optimization techniques provide us with new abilities to reveal significant value. Watch the collection of images displayed in the panel below, to see how the various layers are displayed. Each scene gives evidence of juxtaposition-specific attributes. Look for geologic materials exposed in relation to where trees grow, but are not yet considered Free-to-Grow. Locating open-water is relatively simple. Watch the color patterns to reveal where sub-surface water content extends beyond the stream shorelines. These are typically where hyporheic zones are located, an attribute not easily found when using visual assessments from aerial photography. More GIS data layers are used. For instance, Digital Elevation Models (DEM), once collected as 90-meter resolution, then to 30-meter and 10-meter. LiDAR data brings this threshold to 1m resolution. 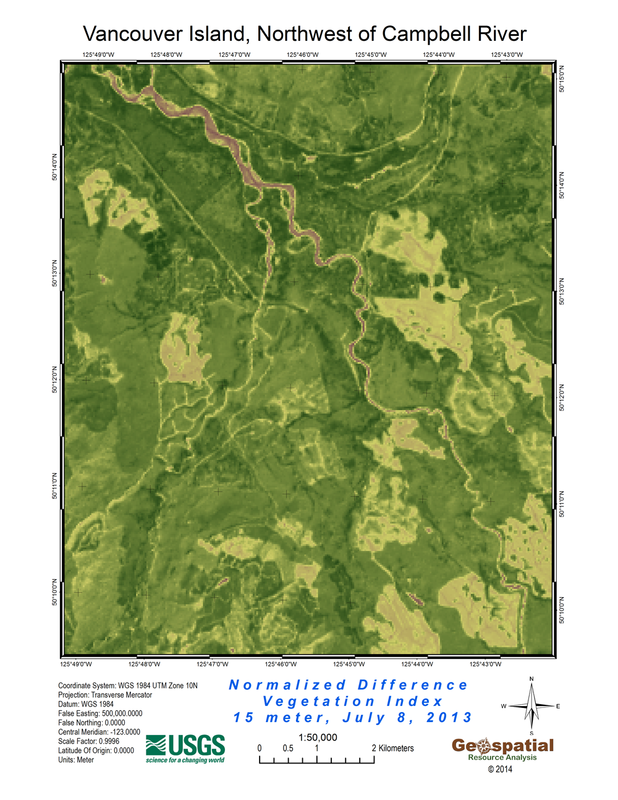 We use those features to derive stream layers across watersheds to reveal more detailed physical site attributes.